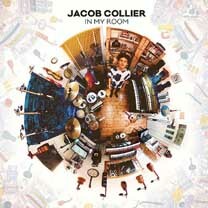 George Graham reviews Jacob Collier's "In My Room"
There are a lot of musicians out there plying their trade, many of them very good, some of them innovative. And then there are those who are one of a kind, seeming to emerge fully formed at a young age. We have such a rare bird this week. It’s Jacob Collier whose debut album is called In My Room. It’s a wild mix of multiply layered vocals and jazz influence along the lines of Bobby McFerrin and a quirky collection of instrumentation, which manifests itself as what I used to call an “ear grabber” record. In 2011, Collier began sharing some of the videos he had created with his multiply overdubs covers of song like Pure Imagination and Stevie Wonder’s Isn’t She Lovely, which attracted a lot of attention including among from some well-known musicians such as Quincy Jones. He also caught the eye of researchers at the famous Media Lab at MIT who helped Collier to create a live version of his layered compositions and an electronic harmony device which allowed him to do the vocal harmonies in real time on a keyboard. Also earlier this year, Collier appeared on the latest album by the eclectic ensemble Snarky Puppy, which we also reviewed. For his debut album, Collier retreated into his music room and created all the voices and instrumental sounds by himself, sometimes with what sounds like dozens of layers of overdubs. He also does mostly original music after making his mark with his creative video covers. The result is quite remarkable. There are the vocal acrobatics of Bobby McFerrin along with some of his whimsy, there is clear Stevie Wonder influence, and he shows his fascination with jazz which he came to somewhat later in life, like at age 15. And there are just the unexpected things that happen when someone who lived and breathed music since being a toddler spends most of his time holed up in a room full of instruments and is obsessed with sounds. Most of Jacob Collier’s 21 years have been leading up to this album, spending much of his time in his family’s hereditary music room, exploring and experimenting, along with the inevitable practicing. Still, the album comes as a kind of sonic bolt from the blue, a real “ear-grabber” in a day in which there are so few really original sounds about. Collier has already been attracting attention with his clever videos usually showing six or as many as 14 versions of the boyish Collier singing the parts on screen. While his music has some overlap with soul, R&B and jazz, the level of musical sophistication puts it up there with some serious art rock. The first few times one listens there is likely to be a jaw-dropping reaction, and after that, it’s an appreciation for the combination of the originality and the painstaking craftsmanship that went into the record. Those with long memories might remember Mike Oldfield in the 1970s, creating such elaborate music by himself, toiling away solitary in the studio. But of course, Oldfield’s music was quite different. And though Collier did create this album by himself, he does perform live with others and as mentioned puts in a guest appearance on the newest Snarky Puppy album, and has recorded with the WDR jazz big band in Germany. Our grade for sound quality is an “A.” Collier has an appreciation for sonic clarity and for all the layering and some pitch shifting on his vocals, the sound remains clean and undistorted. And the dynamic range, how the recording maintains the differences between loud and soft is far better than the average CD today. Last week in our review of Sarah Jarosz’ latest recording, we talked about how musical prodigies have evolved as they get older. In a recent interview, Jacob Collier spoke of constantly moving ahead and noting how he has changed since just a couple of years ago. It will be interesting to hear the further evolution of this remarkable artist. Until then, his album In My Room is most impressive, and one of the creative standouts of the year.